Free download Samsung PC Studio latest version. Samsung is the one of top 5 mobile phone manufactures in the world. After adding the Android OS, the sale of Samsung smart phones has been increased and it reached about 235 million in 2009 and more than 280 million in 2010. 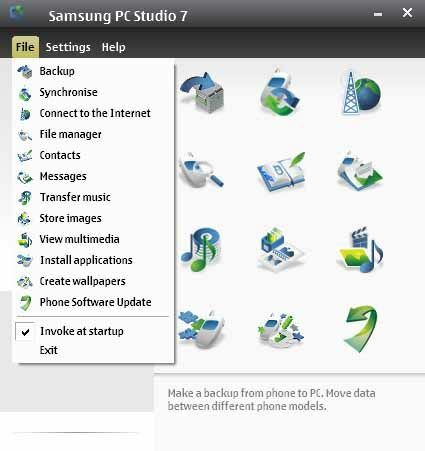 Samsung PC Studio is a complete mobile phone manager for Samsung. It has the same features as the Nokia PC Suite has for Nokia smart phones. You can easily synchronize your contacts, emails, calendar items, transfer files and backup your complete mobile data. You can easily transfer your contacts between PC and mobile phones. If you want to install any app on your smart phone, you can drag and drop it to install. Samsung PC Studio also enables it to auto convert audio and video formats according to your smart phone. You can connect your smart phone with Samsung PC Studio via different options such as USB cable, infrared, bluetooth or serial cable. There are many options in Samsung PC Studio such as Backup, Synchronise, connect to internet, manage your files, contacts, messages, transfer music, store images, view multimedia, install application, create wallpapers and update phone software.If you want to access internet on your PC, then it is very easy to use your mobile phone internet on your computer. Just connect phone with Samsung PC Studio and use the option connect to the internet. Your computer will use internet connection of your mobile phone service provider.